THE FIRST KNOWN Ebola outbreak devastated a small village called Yambuku and the surrounding area in the north of the Congo in 1976. When it started to kill patients in a missionary hospital, a Flemish nun was infected, and samples of her blood were sent to Belgium. Scientists soon realized they were dealing with something unknown. After a harrowing experience with the virus in the lab, Peter Piot, a 27-year-old doctor who was one of the first to examine Ebola, left his pregnant wife in Belgium and set off for the Congo, then called Zaire, to track down the source of the outbreak. There he joined researchers from around the world for a terrifying hunt for the origin of the disease. Piot wrote about the experience in his book “No Time to Lose: A Life in Pursuit of Deadly Viruses.” Using photos from the CDC’s Public Health Image Library, we’ve illustrated their several expeditions into the Congo. Using photos from the CDC’s Public Health Image Library, we’ve illustrated their several expeditions into the Congo. Their mission was in Yambuku, 700 miles northeast. Stories of birds dropping out of the sky, sick with fever, and of human bodies by the roadsides had terrified pilots who at first refused to fly the team to the closest airfield in Bumba, a town of 10,000 on the edge of the epidemic zone. Once there they set out to search nearby villages for victims of the disease. Some were untouched, while others had seen entire families wiped out. Many of the tiniest villages had built barricades at their entrances, setting up a quarantine system – something village elders had learned to do when smallpox epidemics had torn through the region in the past. The doctors checked mosquitoes, pigs, and cows, trying to find the source of new infections. They examined seven bats and 123 rats. Investigators even pureed 818 bedbugs from infected sites, but none carried any trace of the virus. They determined that Yambuku was the outbreak’s center. One of the first survivors was the wife of the headmaster of the local school, one of the first casualties. Before showing signs of infection, the headmaster had returned from the forest carrying monkey and antelope carcasses. As far as anyone knows, he was “patient zero,” potentially having caught the infection from the dead monkey. From there it spread through body fluids, including blood on the reused needles. While working through a handle of Kentucky bourbon one night, they looked at a poorly drawn map and saw the Ebola River — somewhat nearby, but not as close as they thought. But that’s the name they chose. They’d been calling the disease the Yambuku virus but did not want to stigmatize the village further. 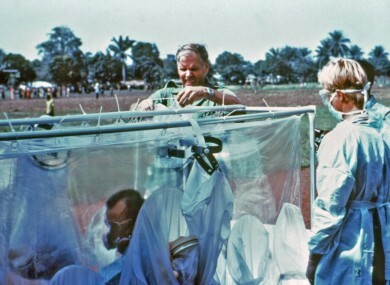 It wasn’t long before they had to evacuate a Peace Corps doctor in one of the first negative-pressure isolation units ever designed, designed to trap both virus and person “for the duration of our treatment, or our few remaining days alive,” according to Piot. By flooding the area with resources, they were able to provide enough medical treatment for those infected as well as food and other resources for those trapped in the region. Though they didn’t know what they were dealing with at the time, they were able to avert a bigger disaster. The first Ebola outbreak killed 88% of those infected, 280 people. It’s possible that the same infection was responsible for a Sudanese outbreak that year, which killed another 151, 53% of those infected. The area was almost impossible to explore, and locals didn’t always trust or believe the doctors, but the isolation helped contain the disease. Now that Ebola is in urban areas, it’s much harder to slow the infection rate. Email “Vintage photos show the terrifying first expeditions into the Congo to track down Ebola ”. Feedback on “Vintage photos show the terrifying first expeditions into the Congo to track down Ebola ”.